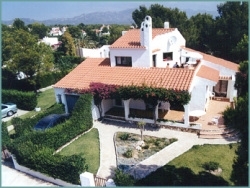 VILLAS AND APARTMENTS TO RENT IN TRES CALAS, SPAIN. Welcome to our selection of holiday homes to rent in Tres Calas, Spain. A holiday destination that is not overflowing with tourists, but where you can blend in with the local population and enjoy your holiday, Tres Calas welcomes you with an unobtrusive character that makes it quite easy to miss. However, the place is a well-hidden oasis where you can unwind and take things at your own pace without having to rush from one site to another and trying to fit in something for every minute of the holiday. Such hectic schedules tend to make you feel more tired than relaxed or rejuvenated. Though not being a major tourist hub does not mean that there is a lack of things to do here! Close by is the Universal Studios Adventure theme park at Port Aventura that is well worth a visit when the town of Tres Calas has been explored. With over 30 rides and 100 daily performances of different shows, with shops and restaurants, not to mention its own beautiful beach, it will more than keep you occupied. Children will get to meet their favourite cartoon characters, while you can enjoy the different rides, which are based along different themes, like Mediterranean, Polynesian, Mexican etc. Each of them is unique and quite interesting! On offer also are a variety of shows that vary from mild to exciting to thrilling. This interesting interlude will definitely make you look forward to getting back and relaxing at Tres Calas! Indulge the historian in you by exploring the ruins of Tarraco which are close by. Some of them even pre-date the Roman period. The once grand palace of Augustus is today a prison for the unsavoury. There is also an amphitheatre, a citadel, the so-called tower of the Scipios that you can take in. Besides these, there are also many old Churches and monasteries that are worth visiting for the religious sentiment, as well as to admire the Roman and Gothic architectural elements. The best part of visiting Tres Calas is that you are not swamped by tourists, but can take things slowly as you enjoy each and every thing that the place has to offer. Finally, isn�t that what holiday is all about? Looking for self catering holiday accommodation in Tres Calas? Then below is a selection of holiday apartments in Tres Calas and holiday villas in Tres Calas that can be rented direct from their owners. You can either click on each listing for further details or you can use our search engine on the left if you are looking for something in particular.